The film takes place in a single day and night. The film opens with the two main characters, Harry (Anthony Edwards) and Julie (Mare Winningham), meeting at the La Brea Tar Pits and immediately falling in love. After spending the afternoon together, they make a date to meet after her shift ends at midnight at a local coffee shop, but a power failure means Harry's alarm fails to wake him and Julie leaves for home. When Harry awakes that night he realizes what's happened and rushes to the shop, arriving at 4 AM. Harry tries to call Julie on a pay phone, but only reaches her answering machine, where he leaves an apology. When the phone rings moments later he picks it up, hearing a frantic man named Chip (presumed to be in a missile silo) telling his father that nuclear war is about to break out in less than seventy minutes. When Harry finally gets a chance to talk and asks who's calling, Chip realizes he has dialed the wrong area code. Chip then pleads with Harry to call his father and apologize for some past wrong before he is being confronted and presumably shot. An unfamiliar voice picks up the phone and tells Harry to forget everything he heard "and go back to sleep" before disconnecting. Harry, confused and not entirely convinced of the reality of the information, wanders back into the diner and tells the other customers what he's heard. As the patrons scoff at his story, one of them, a mysterious businesswoman named Landa (Denise Crosby), calls a number of politicians in Washington on her wireless phone and finds that they are all suddenly heading for "the extreme Southern Hemisphere," i.e. Antarctica. After Harry tells her some launch codes that Chip told him, she verifies that they are real and, convinced of the danger, immediately charters several private jets out of LAX to a compound in a region in Antarctica with no rainfall. Most of the customers and staff leave with her in the owner's delivery van. When the owner refuses to make any stops, Harry, unwilling to leave without Julie, arranges to meet the group at the airport and jumps from the truck. Harry is helped and hindered by various strangers, who are initially unaware of the impending apocalypse. In the process he inadvertently causes several deaths and is deeply shaken by that, yet still he goes on. When he finds Julie and later tells her, she notes that there is no confirmation of the attack. Desperate to reach the airport and not having a car, Harry finds a helicopter pilot (Brian Thompson) and tells him to meet them on the roof of the Mutual Benefit Life Building, where Landa ordered a helicopter and a large amount of supplies to be delivered. Julie has also tried to find a pilot on her own, and in the moments it takes to find her, Los Angeles descends into violent chaos. There is still no confirmation any of this is real, and Harry wonders if he has sparked a massive false panic in the example of Chicken Little. However, when he uses a phone booth to contact the father of the man who called him (using the number of the booth and the area code the man was trying to use) he reaches a man who says his son is a soldier. Harry tries to pass on the message he was given, but the man hangs up before Harry finishes. When they reach the top of the Mutual Benefit building they find the pad empty, and the roof manned only by Landa's drunk co-worker (Kurt Fuller). Any doubts about a false alarm are eliminated when a warhead can be seen streaking across the sky. As they fear the end, the helicopter suddenly returns with the pilot badly wounded but fulfilling his promise to come back for them. After they lift off from the roof, several warheads hit and the EMP from the detonations causes the helicopter to crash into the La Brea Tar Pits. As the helicopter sinks and the cabin fills with natural asphalt tar, Harry tries to comfort a hysterical Julie by saying someday they will be found and they will probably be put in a museum, or maybe they will take a direct hit and be turned into diamonds. Julie, accepting her fate, calms down and takes comfort in Harry's words, and the movie fades out as the tar fills the compartment. A final explosion seems to imply a direct hit has taken place. Before Miracle Mile was made, its production had been legendary in Hollywood for ten years. In 1983, it had been chosen by American Film magazine as one of the ten best unmade screenplays. Steve De Jarnatt wrote it just out of the American Film Institute for Warner Brothers with the hope of directing it as well. The studio wanted to make it on a bigger scale and did not want to entrust the project with a first-time director like De Jarnatt. 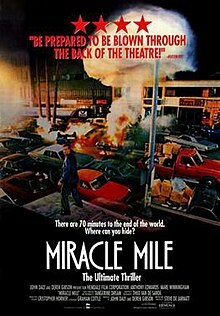 Miracle Mile spent three years in production limbo until De Jarnatt optioned it himself, buying the script for $25,000. He rewrote it and the studio offered him $400,000 to buy it back. He turned them down. When he shopped it around to other studios, they balked at the mix of romance and nuclear war and the film's downbeat ending. At one point, it nearly became the script for the eventually separate made Twilight Zone: The Movie. Before Anthony Edwards was cast, production nearly began with both Nicolas Cage and Kurt Russell. Of the script, Edwards said, "It scared the hell out of me. It really made me angry too ... I just couldn't believe that somebody had written this." John Daly of Hemdale Films gave De Jarnatt $3.7 million to make the film. The following locations in Los Angeles were used in this film: Johnie's Coffee Shop; La Brea Tar Pits; Miracle Mile District; Pan-Pacific Auditorium in the Fairfax District. Miracle Mile is the twelfth soundtrack album by Tangerine Dream and their thirty-seventh overall. Miracle Mile received generally positive reviews among critics. Roger Ebert praised the film, claiming it had a "diabolical effectiveness" and a sense of "real terror". In her review for the Washington Post, Rita Kempley wrote: "It seems [De Jarnatt]'s not committed to his story or his characters, but to the idea that he is saying something profound—which he isn't." Stephen Holden, in The New York Times, wrote: "As Harry and Julie, Mr. Edwards and Ms. Winningham make an unusually refreshing pair." In his review for the Boston Globe, Jay Carr called it: "... a messy film, but it's got energy, urgency, conviction and heat and you won't soon forget it." British film and television critic Charlie Brooker, in an article for the BAFTA web site written in September 2008, awarded Miracle Mile the honor of having the "Biggest Lurch of Tone" of any film he had ever seen. The review aggregator Rotten Tomatoes reported that 89% of critics gave the film a positive review, based on 28 reviews. Sitges - Catalan International Film Festival: Best Special Effects; 1989. Saturn Award: Saturn Award for Best Classic Film DVD Release; 2016. Sundance Film Festival: Grand Jury Prize, Dramatic, Steve De Jarnatt; 1989. ^ "Miracle Mile". Turner Classic Movies. Atlanta: Turner Broadcasting System (Time Warner). Retrieved July 10, 2016. ^ Miracle Mile at the American Film Institute Catalog. ^ a b c d e f g Richardson, John H. (May 28, 1989). "Miracle Mile Made with Slowly Measured Steps". The St. Petersburg Times. Saint Petersburg: Sanoma Oyj. ^ Hunter, Rob (January 28, 2016). "35 Things We Learned from the Miracle Mile Commentary". Film School Rejects. Retrieved January 11, 2019. ^ a b c Bertrand, David (November 5, 2015). "Interview: Director Steve De Jarnatt Looks Back on Cult Classic MIRACLE MILE". Shock Till You Drop. Retrieved September 5, 2017. ^ Harris, Will (15 February 2013). "Anthony Edwards on Zero Hour, ER, and being Top Gun's "Mr. Lefty Liberal Peace Lover"". AV Club. Retrieved 14 August 2016. ^ Ebert, Roger (June 9, 1989). "Miracle Mile". Chicago Sun-Times. Chicago: Sun-Times Media Group (Wrapports LLC). Retrieved March 3, 2010. ^ Kempley, Rita (June 14, 1989). "Miracle Mile to Nowhere". The Washington Post. Washington, D.C.: Nash Holdings LLC. Retrieved March 3, 2010. ^ Holden, Stephen (May 19, 1989). "Waiting in California for the next Big Bang". The New York Times. New York City: The New York Times Company. Retrieved March 3, 2010. ^ Carr, Jay (June 9, 1989). "Miracle Mile". The Boston Globe. Boston: Boston Globe Media Partners, LLC. Archived from the original on September 11, 2016. Retrieved August 14, 2016. ^ "Miracle Mile". Rotten Tomatoes. Los Angeles: Fandango Media. This page was last edited on 2 March 2019, at 20:59 (UTC).